According to the Dictionary of Canadian Biography, my great-great-grandfather Stanley Clark Bagg had one son, Robert Stanley.1 That is a true statement, but I suspect his four daughters would take issue with their omission from the article. In fact, Stanley Clark Bagg and his wife Catharine Mitcheson had one son and five daughters, although their first-born died at age two. Their children were: Mary Ann Frances (1845-1847), Robert Stanley (1848-1912), Katherine Sophia (1850-1938), Amelia Josephine (1852-1943), Mary Heloise (1854-1938) and Helen Frances (1861-1935.) All four of the girls appear to have been independent, intelligent and strong-willed. Stanley Clark Bagg (1820-1873) inherited a vast expanse of property in Montreal from his maternal grandfather and he seems to have supported the family primarily on rental income. The land consisted of several adjoined farms on the east side of Mount Royal, north of the city limits. The family lived in a big house called Fairmount Villa near what is today the corner of Sherbrooke Street and Saint-Urbain. Stanley had worked as a notary for about 10 years, then devoted himself to managing his properties. He also had time to follow his many intellectual interests, including numismatics (the study of coins) and archaeology, and to write about them. He became well known in Montreal, not only because of his extensive landholdings, but also as an author and a philanthropist. Stanley and Catharine placed great importance on the children’s education, and the whole family took a grand tour of Europe in 1868-69, visiting museums, cathedrals and ancient sites in Pompeii, Paris and other locations. This interest in travel, history and the arts must have rubbed off on the girls because Katharine and Helen were both writers and Amelia was an amateur artist. Stanley’s sudden death from typhoid at age 53 came as a shock to all, and a colleague at the Numismatic and Antiquarian Society of Montreal wrote an obituary that was published in the society’s journal. Other local historians also wrote about Stanley Clark Bagg’s life and family history, but these accounts contained several inaccuracies and completely omitted mention of his daughters. Amelia married twice. In 1890, she married Joseph Mulholland (1840-1897), a real estate agent with the Bagg family business. Five years after Joseph died, she married John George Norton, a widower who was Anglican Archdeacon and Rector of Montreal. Amelia had no children of her own, but my mother remembered her fondly and she seems to have been the go-to member of the family in troubled times. Amelia was also involved in the family real estate business, selling and leasing properties, but her most important legacy was a ledger she kept from 1891 to 1927, in which she recorded land sales and other accounts related to the Estate. She is buried with her first husband in the Workman family plot in Montreal’s Mount Royal Cemetery. Mary Heloise married Montreal stock broker Robert Lindsay (1855-1931). They lived in downtown Montreal and had five children: Ada, Lionel, Marjorie, Stanley and Marguerite.5 Lionel, a gentle pediatrician, was the only member of the family I knew. Mary Heloise is buried in the Lindsay family plot in Mount Royal Cemetery. According to a 1930 article about Helen published in Women of Canada, she wrote magazine articles about her travels, but it was probably under a pseudonym and I have yet to find any of them. She had no children and is buried in Vancouver. 2. These births, marriages and deaths can be searched in the Quebec, Canada, Vital and Church Records (Drouin Collection), 1621-1968, available on www.Ancestry.ca. 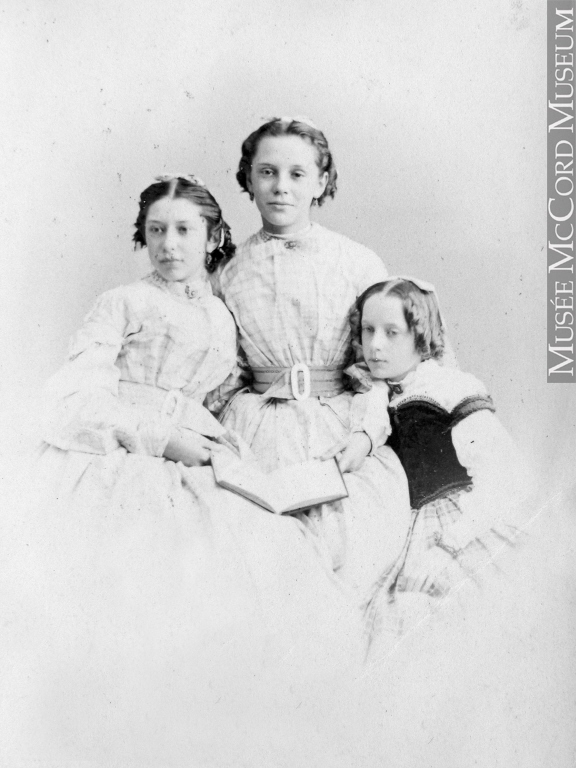 These events are also recorded in the Bagg family bible, which is part of the Bagg Family Fonds at the McCord Museum in Montreal. 3. Mrs. W. Lennox Mills, Reminiscences of a Cruise in the Mediterranean and a Visit to the Holy Land and Egypt, 1910. 4. Amelia Josephine Bagg Mulholland, Ledger, 1891-1927, McCord Museum, Bagg Family Fonds, P070/B07. “Someday I’m going to write a book!” How often have you said that, or heard a friend or relative make a similar statement? You probably didn’t hold your breath until it appeared. So it comes as a surprise to the nine members of Genealogy Ensemble, the family history writing group of which I am a member, that we are actually doing it. In November, we will launch Beads in a Necklace, a book of collected short stories based on our family research. These real-life stories include a young Scot who immigrated to Canada and became a famous gospel singer, memories of queuing up for food rations in post-war England, and a young girl who was kidnapped from her home in southern Maine by the Abenaki Indians in 1692 and spent the rest of her life in Quebec. I have included stories about the Bagg, Mulholland and Smith families. Now that it’s about to be published, I thought it would be worthwhile to look back at some of the lessons we learned that might help potential authors. The genesis of Beads in a Necklace goes back to 2012 or so when we decided to write about our families and share our stories. Since then, we have met once a month to critique each other’s work, improve our story-telling skills and gain confidence. After a while, our stories were so good, we wanted to share them more widely. We began taking turns posting them on our blog, Genealogy Ensemble. The book authors among us kept talking about the possibility of publishing something, but the idea always seemed far away. Last year, we got serious about the idea. With 2017 being the 375th anniversary of the City of Montreal, where we all live, and Canada’s 150th birthday, we decided it was time to publish a collection our stories: a 250-page book, with a proper binding and a beautiful cover, that we will be able to give to friends and relatives for Christmas. We started discussing the project last September. The first step was to each choose our five favourite stories. Each article had to be about 500 words long and include endnotes citing the sources of our facts. Apart from that, there were no rules. After considerable debate, we agreed on the title Beads in a Necklace, and we came up with a logical way of organizing the stories into sections. We all pitched in to help at various stages of the process, depending on our areas of expertise. I did most of the editing, with help from Tracey. I had worked as a journalist, and Tracey and Dorothy are also professional writers. That helped a lot: we know how to tighten a longwinded sentence, spot a good first paragraph and structure a story so it flows smoothly. Several members of our group have natural writing talent that they never knew they had, but they are still learning the skills that come from writing on a daily basis. And sometimes writers have to let go of their egos and allow changes. Of course, everyone could say yes or no to editing suggestions, and we always managed to find compromise solutions. Sandra, who has experience preparing annual reports in the corporate world, did most of the layout, with Claire’s assistance. Claire also knows her way around digital photography and she cleaned up the often scratched or faded photos we wanted to use. We even got friends involved: one friend who is a proof reader is making sure there are no typos or missing punctuation marks, while another friend who is a graphic designer has agreed to do the cover. There have been many details to consider. The people responsible for the layout had to decide on the size of the book and the fonts to use and get quotes from a local printer. Someone has to look after making a digital version available, and we have to crank up our marketing strategy. Last but not least, we had to find a place that is big enough but not too expensive for our celebratory book launch. We found a church hall that is perfect! Most of the glitches we have encountered have been computer-related. For example, we tried both Google Drive and Dropbox so we could upload files that everyone could edit. Both did the job, but we found Google Drive to be a bit unstable, while for a reason I still don’t understand, I can’t see many of the changes that Sandra and Claire have made to the layout in Dropbox. This has been a long process. We were editing in January and the book will be launched in November. But we are all thrilled about it. Furthermore, I hope to apply the lessons I have learned from this experience when I write a book about my own family’s history. Just don’t hold your breath until it appears.